The Main Hall was built as a Sunday School Hall in 1911. It is 11.3m long by 7.3m wide (37’ by 24’). The floor is solid wood and the lower part of the walls are bricked with glazed bricks. It has an adjacent basic kitchen with a door opening onto the hall, the use of which can be included in the hire if required. It can be accessed through the side entrance or through the rear door. There is easy access to male, female and disabled toilets. The hall is fully accessible through the rear door. A range of tables, chairs, basic crockery and cutlery is available for use by hirers of this hall. 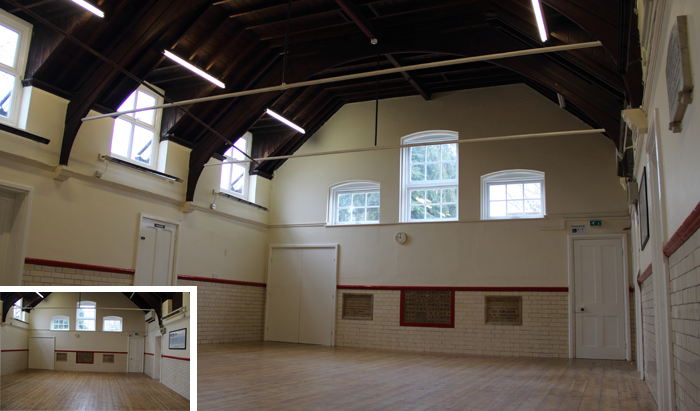 The standard hire rate for this hall is £18.50 per hour. Discounts apply for members (10%), for regular hire (10%) and single bookings of 3 hours or more (10%). Please note: when using the main hall, the doors to the corridors and side rooms must be kept closed. This is to prevent noise disturbing other centre users and neighbours and to ensure that small children don’t wander out of the hall.